The ATT Tank PVRV Rim Vents are installed on tanks equipped with a rim seal system that creates a vapor pocket, such as a mechanical shoe seal or double wiper seal system. 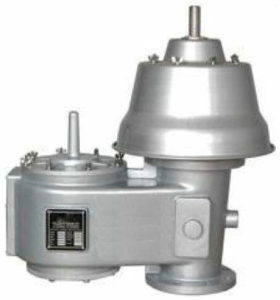 The rim vent is connected to the rim vapor space by a pipe and releases any excess pressure or vacuum that is present. The rim vapor space is bounded by the floating deck rim, the primary-seal shoe, the liquid surface, and the primary-seal fabric. Rim vents usually consist of weighted pallets that rest on the gasketed surface. Commonly the given rules are that for single deck internal floating roofs a Pressure Relieve or Pressure Vacuum Relieve valve might be needed, for double deck floating roofs and spider decks having a low sinking depth a Pressure Relive valve only will be sufficient. ATT Tank Rim Vent sizes are custom calculated to meet each individual tank within the requirements of both regulations and customer wishes.